The only way to have fun in Hearthstone is to violate deck building rules or the Card Balance Philosophy document. Those of us capable of critical, rational thought have known this for some time. Some of us have even tried to go to the Hearthstone forums with good arguments to make Hearthstone better, only to be crushed under an avalanche of intellectually dishonest, abusive sycophants. Indeed, because Hearthstone is at least 4 to 12 months away from being finished, I’ve written the entire game off. I can’t play games with my friends in a casual environment and enjoy any progression whatsoever, and 1 v. 1, netdeck v. netdeck, brainless, coin flip fake sports are the least compelling activity in all of gaming, bar none. So, I approached the release of the first wing of Naxx with dueling expectations: We grade on a curve, and Blizzard has fleeced gamers who hate themselves for 12 billion dollars in WoW subs alone since WoW stopped being a game in favor of being a self-esteem engine in 2008, but Blizzard has no idea how to design, develop, balance, or administrate a CCG. Naxx, therefore, was a total crapshoot in my mind. I’d avoided the Naxx hype almost en total, since why waste cycles on a farce that isn’t funny. However, since the first taste was free, and I’d had enough gold on my account to buy the second wing, I figured I’d give Naxx a go and see if there’s any glimmer of potential to be found anywhere. The results in a word: nope. Ironically enough, before we start, I have to give a nod at how lucky I was to even be able to purchase the second wing of Naxx for gold in the first place. The fact that there are still people reporting in the General forums that they are unable to make any purchases of any kind is an indictment of how little the Blizzard enterprise cares about its customer base. It is SOP for Blizzard to put their games out months before they are finished, so some amount of snafu is to be expected. After all, pre-alpha software is rarely bug free. in a deck that runs black. The sin, of course, is to put super powerful cards in the playable set, and then not make them available in every deck that could run the card. At this point, we can return to Naxxramas, because there are some cool cards that are used, but you as a player don’t get to use them. At least we know where the mind, body, heart, and soul of the design team was while it wasn’t fixing Hearthstone’s base set or completing Hearthstone’s feature set over the last four months since Hearthstone’s “release” (When looked at as a CCG, Hearthstone is still in Alpha phase, regardless of what the marketing people at Blizzard or Blizzard fanbois think). They were making a bunch of cool things todangle in front of players that players can’t use. can be used, but what difference does that make when none of the abilities can be used by the players? Putting these kinds of abilities in the hands of players would have added layers of depth to Hearthstone, but depth is verboten in Hearthstone, so the players will never see anything remotely like the abilities that were shown in this throw away content. These hero abilities are a sobering reminder that Hearthstone was designed to be a spectacle of fake sport first, a video game second, and a well-designed, compelling CCG a distant, distant third. Not surprisingly, once you’re in the adventure itself, all the superficial stuff works. Kel’thuzad is there to supplement the Drarven P.T. Barnum that greets you when you launch Hearthstone, acting as a “guide” through each wing’s encounters. KT is hardly necessary, since it is impossible to get lost in each wing. There are only 3 encounters and 2 class specific encounters in the basic campaign; these encounters unlock cards for the player to use in deck building. The heroic encounters are a farce. The heroic encounters are harder versions of the base campaign encounters; however, they aren’t harder because the AI plays better or has constructed a better deck. The heroic encounters are an exercise in the player exploiting massively OP enemy hero abilities. I suppose, therefore, it is apropos that the reward for completing heroic mode is meaningless vanity stuff. So, if I understand correctly, I’m supposed to take 1 of my 9 deck slots and build a deck specifically to beat 1 encounter, then tear that deck apart (because it would be worthless in all modes where I can obtain progression) to build another deck specifically to beat another encounter? Oh, I forgot, I’m supposed to be trying to make Top 16 of Legend Rank, so I can run a gauntlet of popular Twitch streamers in a Hearthstone World Championships feeder tournament, so the only deck slots I need are Miracle Rogue, Zoo, Ramp Druid, and Control Warrior. I’m certainly not supposed to be building decks to have fun with my friends [NOTE: Friends is plural, meaning more than 1.] while engaging in banter over Ventrilo and knocking back a beverage—if that were true, 2-headed giant, emperor, grand melee, and attack left defend right would have made it in to Hearthstone’s Alpha build in March, amirite? While we’re on the subject of positives, we can also talk about the class specific encounters. The class encounters require the player to play a pre-canned boss with a pre-canned deck that’s allowed to violate deck building rules. Of these, the Hunter deck is the most blatant violation of the deck building guidelines so far; I summoned at least 10 Webspinners during the encounter. It has to be said I had a lot of fun summoning all those spiders resulting in 2 King Crushes on the field at the same time. The feeling is fleeting, though, because the Hunter encounter is something that can never happen in Hearthstone outside of Naxxramas. Again, I’m reminded that Hearthstone is only fun when you violate deck building guidelines or the Card Balance Philosophy document. Finally, some words on value. The only real reason to get Naxx is the 30 cards that are unlocked by finishing the normal mode wings and the class challenges week to week. Back when I was playing Magic heavily, I would buy 1 display box of boosters per expansion pack. That translates into ~100 dollars retail, which is what I spent on Hearthstone packs after Hearthstone went Alpha in March. Magic expansion sets usually had about 300 cards in them, which is equivalent to the Hearthstone base set. Naxx adds 30 cards to the mix, so to me, Naxx is worth 10% of an expansion set purchase, or around 10 bucks. The content required to unlock the cards is probably worth a little something, so maybe bump that 10 up to 12.50. Naxx is not worth a penny more than 12.50. So what is Naxx? Certainly, an hour per wing’s worth of diversion. It hasn’t to date changed the metagame a lick, despite Ben Brode running his mouth for an hour that it would; apparently, we all have to pay for Military Wing before any appreciable change to the metagame is going to happen. The legendary that’s available to everyone, Maexxna, is garbage, like ETC and Gelbin before her. Weenie rush decks are getting help when they least needed it. The base set is still massively legendary heavy at the top end of the mana range and too utility rare based at the bottom end of the mana range. Leeroy Jenkins combos are still in violation of the Card Balance Philosophy document; thus, they are still broken. Naxx through 2 wings hasn’t really changed anything, besides adding 30 cards for players to overspend on. What I think is saddest of all: The previous scathing 1500 words would be largely irrelevant if Hearthstone’s feature set were complete. If I could come home from work on a Tuesday and throw down 4 games of ALDR with 4 people on the VtW Vent and score a daily for the trouble, then it wouldn’t matter that Hearthstone’s base set was designed over a weekend with crayons and construction paper. It wouldn’t matter that the business model is to make people chase a small set of legendary cards by overspending on card packs. It wouldn’t matter that the Card Balance Philosophy document was written to retcon justification for arbitrary card nerfs and immediately forgotten when it would justify at least 1 card change. It wouldn’t matter that the overall design was focused on <1% of Hearthstone games played (tournaments and Legend Rank), while the rest of us are forced to claw at each other for the scraps. The terrible metagame wouldn’t matter; the worse community wouldn’t matter; the abusive MVPs wouldn’t matter. I’d be playing a CCG with my friends [NOTE: Friends is plural, meaning more than 1.] and having a good time. 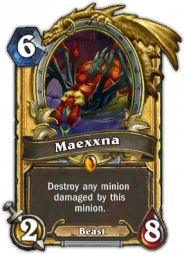 Apparently, having a good time is forbidden in Hearthstone, with or without Naxxramas.